One of the things we look forward to every year is winter citrus, those exquisite jewels of the coldest of seasons. No matter how early the sun sets, satsumas, clementines, kumquats, and (our favorite) blood oranges brighten our days with their sun-kissed skins. Citrus fruits enliven a host of dishes, both savory and sweet. And it's fun (and easy!) to substitute one citrus for another in order reinvigorate a favorite dish. This time of year, we push our grocery carts past the familiar old lemons and steer it straight for the blood oranges. We need to take advantage! They won't be around for long. We bought a dozen, but only needed eight for this recipe for Blood Orange Soufflés that found its way into our email box at just the perfect moment. Sure, there's only two of us, but we have neighbors, so why not make all eight? We texted neighbors J and B the minute-by-minute countdown so they wouldn't end up with sunken desserts. Then the four of us relished each warm, slightly eggy spoonful of tangy, orange-scented clouds. 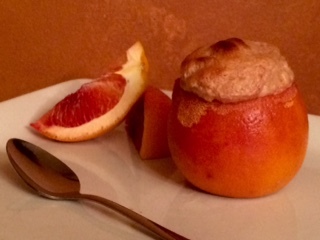 Here are some other recipes we've made with blood oranges, each one as gorgeous and delicious as its main ingredient.